Gorgeous ribbons available in a huge variety of delicious colors and styles! Perfect for gifts, wedding or party favors, crafts, sewing, and decorating! Satin, jute, cotton, burlap, organza, vintage, and more! 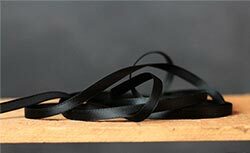 Jet Black Double Faced Poly Satin Ribbon, in 1/4 inch (7 mm) width. This color is a solid shade of jet black. 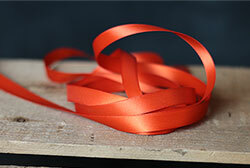 Beautiful double-faced satin ribbon with a lovely sheen (both sides! ), perfect for adding that special touch to gifts, wedding favors, craft projects, sewing, home decorating, clothing, jewelry making, and more! Sold by the yard, so you can have as much or as little as you'd like! 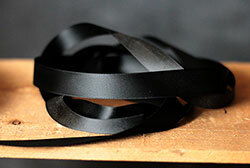 Black Double Faced Poly Satin Ribbon, in 3/4 inch (19 mm) width. This color is a solid shade of jet black. Beautiful double-faced satin ribbon with a lovely sheen (both sides! ), perfect for adding that special touch to gifts, wedding favors, craft projects, sewing, home decorating, clothing, jewelry making, and more! Sold by the yard, so you can have as much or as little as you'd like! 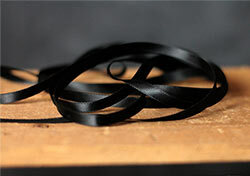 Jet Black Single Faced Poly Satin Ribbon, in 1/4 inch width. This color is a solid jet black. Beautiful single-faced satin ribbon with a lovely sheen on one side, and matte on the other. Perfect for adding that special touch to gifts, wedding favors, craft projects, sewing, home decorating, clothing, jewelry making, and more! Sold by the yard, so you can have as much or as little as you'd like! 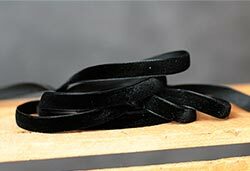 Jet Black Velvet Ribbon - ONE yard of luxurious single faced plush velvet ribbon, in 3/8 inch width. This color is a solid shade of jet black. Perfect for adding that special touch to gifts, wedding favors, craft projects, sewing, home decorating, clothing, jewelry making, and more! Mandarin Orange Double Faced Poly Satin Ribbon, in 1/2 inch (12 mm) width. This orange color is a very bright, saturated, rich shade of orange, like the shade of a mandarin orange fruit rind. Beautiful double-faced satin ribbon with a lovely sheen (both sides! ), perfect for adding that special touch to gifts, wedding favors, craft projects, sewing, home decorating, clothing, jewelry making, and more! Sold by the yard, so you can have as much or as little as you'd like! 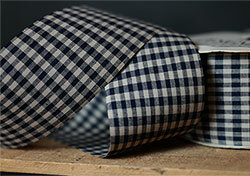 Navy Blue & Tan Gingham Check Ribbon - 2-5/8 inch width, in a gingham mini check of navy blue and light tan (tan is the color of oatmeal). Perfect for wreaths, gifts, floral arrangements, crafts, country decor, etc. 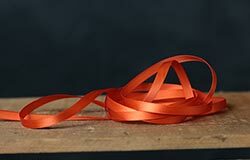 Orange Single Faced Poly Satin Ribbon, in 1/4 inch width. This color is a vivid orange, a fairly true shade of orange. Beautiful single-faced satin ribbon with a lovely sheen on one side, matte on the other. Perfect for adding that special touch to gifts, wedding favors, craft projects, sewing, home decorating, clothing, jewelry making, and more! Sold by the yard, so you can have as much or as little as you'd like! 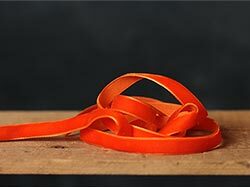 Orange Velvet Ribbon - ONE yard of luxurious single faced plush velvet ribbon, in 3/8 inch width. This color is a rich shade of true orange. Perfect for adding that special touch to gifts, wedding favors, craft projects, sewing, home decorating, clothing, jewelry making, and more!